Today Lida is 8 years old and lives in one bedroom of a two bedroom flat in Minsk, Belarus. Mother and daughter share quarters with her grandmother, two aunts, and a cousin. Nadezhda compresses Lida’s chest so that she can suction out mucus. She needs to do this every 20 minutes so that Lida won’t suffocate. Lida has spinal amyotrophy. She can barely move her arms and legs, and she is completely dependent for breath on a ventilating machine. She cannot be left alone for any time at all. Her mother sleeps next to her at night. Lida’s intellect is normal, and her mother has home-schooled her through 1st grade. 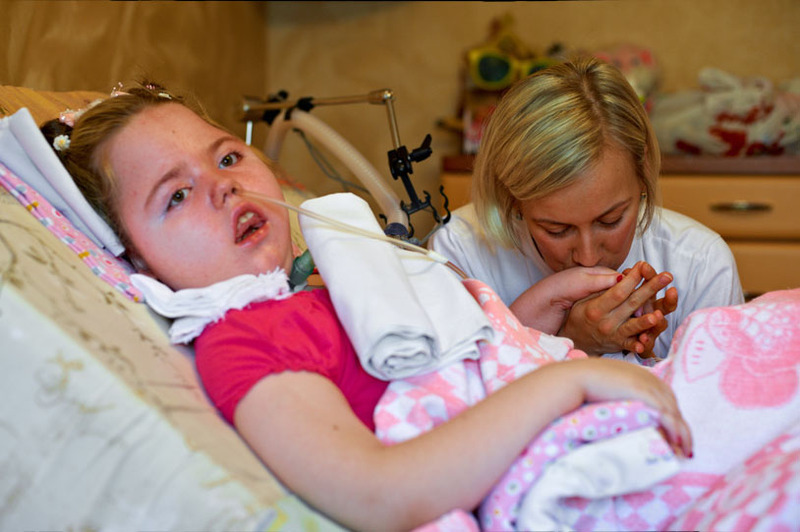 Chernobyl Children International’s Community Care programme gives parents the support they need to take care of their seriously ill and disabled children at home, rather than place them in an institution. As Nadezda talks to us over the sound of the breathing equipment, Lida carefully listens to every word, and sometimes exclaims enthusiastically. “She understands everything,” Nadezda says. “I was 19 when she was born. What did I know about child development? It was my mother who first noticed that Lida was losing her motion and not developing normally. We took Lida to the hospital. The doctors said — Abandon the baby here. These kinds of children die very fast. You are young and single and should live a carefree life. “I cried so much. This was my baby. I was only 19. By the time Lida was six months old, she was taken away from me. I fought for six years to bring her home.” “I stayed by Lida’s side all day, every day, for six years — from the time the institution opened its doors in the morning, until they kicked me out at night. I saw a lot of neglect there. I was vocal about it. I wrote letters, made phone calls, to every part of the government, insisting that I be allowed to bring Lida home. I taught myself to care for her, to run the life support equipment. “Finally, I was told I could bring her home if I could purchase my own equipment. I saved.